If you are a Fitness Entrepreneur looking to get more clients, get more sales & grow your business so you can transform more lives, enjoy more of what life has to offer with more money and stability financially, more time for yourself... then this is the most important news for you. Here’s why: My name is Dean, and I help business owners to get more clients, more sales and grow their business with using Facebook & Instagram sponsored ads. ​I helped a client go from $0 in Sales to 5 Figure sale in 3 months time using one FB Ads repeated over and over again. I helped a local apparel company to make $25K of total sales with only an ad spend of $10. In this training - I will share with you everything you NEED to know on how to run an effective and profitable Marketing Campaign. Deadly Marketing mistakes businesses made that can be very costly to your business. How to Design Your Profitable Sales Funnel! How to Attract Leads Like Magnet Instead Of You Chasing Them. Three Pillars of Marketing Success (Master these three elements, and you are good to go!). How to create an Irresistible Offer that is hard for your clients to refuse. How to choose and design the right image for your ads. How to get attention with videos! How to write ads copy that will make your prospects stop, read and buy from you. How to create a killer sales message in your advertisement that will make your prospects can't sleep at night until they buy your products or services. How to troubleshoot your marketing campaigns when you didn’t get the results you expected. Expecting to make money FAST upon learning from this workshop but not taking action and then asking for a refund. You are NOT SERIOUS about your business and have this “Will See About This” mentality. Sorry, I can only help serious Fitness Entrepreneurs. I had the opportunity to work with Entrepreneurs & Digital Marketers from around the world, working on various projects from different market (Not only in Fitness even if it is my main market). Working with them gave me priceless knowledge and experience when it comes to Marketing. I’ve helped businesses directly or indirectly by giving advices on how they can improve their Marketing and they are happy with the tweak and get better results out of it. 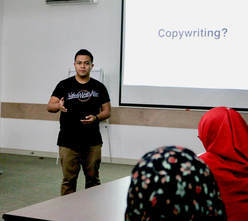 I was given the opportunity to be featured in Brunei Times, regular contributor to Bizbrunei.com where I share my marketing tips and proven strategy, Invited to give talks at DARe, Livewire, UBD (Brunei Darussalam) in the area of marketing to help businesses, as well as short training on email marketing in Kuala Lumpur for a coaching company. Not only that, I was given the trust to work with one of the top Fitness Business Coach - Chris Dufey to write all the sales materials for his premium coaching clients. How Much Is The Training? Let me ask you a question first. If I can help you grow your business and get more sales by teaching you proven and tested marketing strategy used by top Fitness Entrepreneurs, how much are you willing to pay for it? Definitely this is NOT going to be free. I don’t mind giving tips, but what I am offering right here is EVERYTHING I KNOW that’s proven and tested to get results. If I can spend just $50 on Facebook ads and made $1400 of sales for ONE PRODUCT, don’t you want to get the same kind of result? I initially thought of charging RM500, because I believe you can still make double, triple or quadruple the amount of money that you are going to pay. Your Money Back 100% No Questions Asked! ...for you for FREE if you sign up for this event. It's like One-on-One Online Coaching! Venue: Flexmob Studios, Petaling Jaya. If you have read this far, I believe you are serious about your business and how it will change your life. Amazing things happen when business are going good. Take note, before you register for this workshop, I will talk to you and see whether this workshop is for you or not. The venue can only fit 40 people though. #1 Is this for me? If you are a Personal Trainer, Online Fitness Coach, Owns a Gym, Sells Supplement or anything to do with Fitness, whether full-time or part-time… and you want to grow your business, get more clients and more sales, then yes, this training is for you. #2 How much is the training? It is only an investment of RM150 for early bird (RM180 after 24th June 2018). I can promise you, if you take action on what you are going to learn, you will make at least 10X your investment. #3 Why are you doing this training? Why don’t you keep your secrets to yourself? #4 What is included in this training? It is a 3 hours intensive training, where you will learn all the necessary strategies and tactics to generate more leads, more sales, more clients and grow your business with a proven & tested marketing strategy. If you do whatever being taught in this training - I will believe you will get better results than your previous marketing efforts. Disclaimer: Results may vary. I, as a marketer, will do my very best, to share all the proven and tested strategies and tactics to make it work for your business. However, the end part of this training is very crucial. What to do when you don’t get results? I’ll share with you how to troubleshoot your marketing plan. #6 Alright, I’m In! How do I sign up? #7 Where & When is the training will be held?